Deep Foundation Systems by Foundation Masters, LLC we specialize in Deep Foundation for residential and commercial projects. If you have a set of plans send them over along with your soil boring’s for a FREE review by our Engineers, we will give you a price on all available options that best fit your site conditions. For all Architects and Engineers if you need help with Soil Boring’s and/or Deep Foundation Design please feel free to reach out to us. Deep Foundation Systems are utilized when weak soils are present or when the loads of the structure exceed the load bearing capabilities of the soils in-witch the structure will rest on. 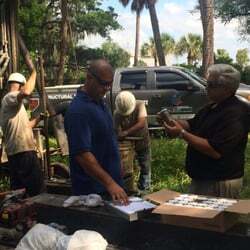 Foundation Masters, LLC is a Licensed Civil Engineering Company in Florida and also a certified building contractor. There are a number of different types of Deep Foundation Systems that can be used, Foundation Masters, LLC will design and install the most cost effective Deep Foundation System for your project needs and your site requirements. Foundation Masters, LLC has years of experience in designing and installing Deep Foundation Systems. If you already have a set of plans for a Deep Foundation System send them over and we would be happy to bid on your project.